The best juicer is………the one you will use! Super foods are ‘in’. People are going mad for all sorts of things from gogi berries to maca powder and cacao nibs. However, I was really taken aback when someone said their diet club had told them that pasta is a super food; it is not. So what makes something a super food? 2 things. Firstly, it will have an unusually high nutrient content; things like vitamins, minerals, enzymes or good fats. Secondly, the nutrients will be in a form that the body can easily absorb and use. This is called bio-availability. I have some videos on different superfoods here (scroll down through top tips and testimonials to get to the superfood series). 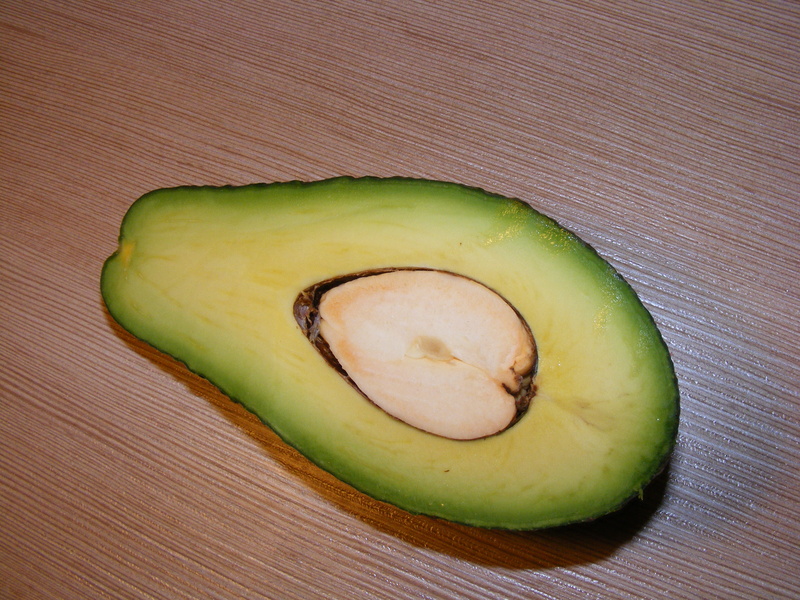 Take the avocado, a true super food. This pear-shaped fruit is packed with amino acids, vitamins, minerals, enzymes and good fats. I base my breakfast smoothie on avocado. They’re also great as part of a salad. Contrast this with pasta which is just wheat starch. Like bread or Yorkshire pudding, it’s ‘padding’ with only a bit of protein, a few minerals, hardly any vitamins and no good fat. It will cause weight gain without boosting your health. 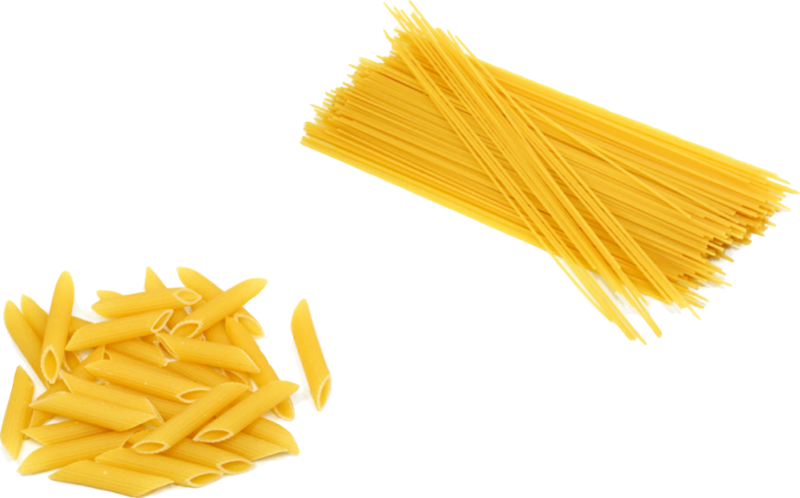 I’m quarter Italian and enjoy pasta as much as the next person but I eat no more than a handful in a meal. After all, in Italy pasta is not a main dish, it’s a starter. And what is this bizarre Cumbrian custom of serving lasagne with chips? That’s adding padding to more padding. Instead, have it with a large, mixed salad, dressed with olive oil and balsamic vinegar. The goodness has diminished drastically in our modern diet. Super foods can help to fill the gap and give you a boost but a few gogi berries won’t make up for a poor diet. Build a solid foundation and always aim to eat well. Top tip – Use super foods to enhance a good diet. The Eat Well Gang got together in November for a special Jackie’s Gee Up, led by Paul Heslop, juicing enthusiast. Since doing the Eat for a Better Life course, juicing has been a regular activity in the Heslop household and they’ve reaped the benefits in great health. See Paul’s testimonial video here. You can juice many fruits and vegetables. For health, it’s best to concentrate on veg with just a little fruit to take away the bitter taste. Wheatgrass featured prominently on our night and was combined with vegetables and fruits giving a range of flavours. See Paul in action on the videos page under superfoods. In the New Year, I’ll be challenging my readers to make green juices. Christmas is coming soon, so if you don’t have a juicer perhaps some kind person might buy one for you as a present. The long dark nights, wind and rain confirm that we are heading into winter. All around me, people are coming down with coughs and colds. In spite of their generosity in sharing – I don’t want one! Do you? Did you know that most of your immune system is in your gut? Your susceptibility to disease can be affected by what you eat and drink. So when my husb and came down with a cold, I reached for echinacea, wheatgrass and vegetable juices and coconut oil. Then I cooked up some of James Wong’s special chicken soup for colds including garlic, ginger, chillies. Effective and delicious. Oily fish and eggs for vitamin D. Among its many health benefits, vitamin D primes our T cells. Your skin makes it for you in the summer sunshine but I live far to o far north to make much at this time of year so I take it as a seasonal supplement. 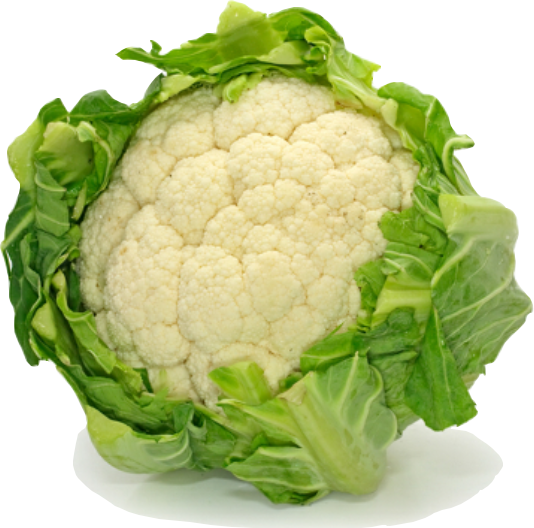 Vegetables – they give you lots of vitamins, minerals, enzymes and antioxidants plus fibre to feed the good bacteria in your gut. Coconut oil – has anti-bacterial and anti-viral properties. Live natural yoghurt and fermented vegetables repopulate your good bacteria. Sugar – it feeds bad bacteria, unbalancing your system. 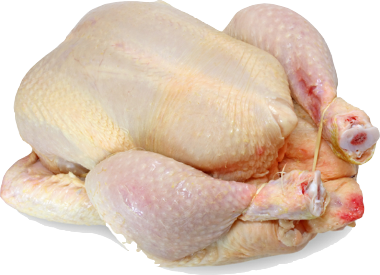 Processed food – you want your body to fight infection, not use all its energy fighting bad food. Get lots of sleep to make the powerful anti-oxidant melatonin. Exercise, especially out in the fresh air (but not vigorously once you have a cold). Top tip: Eat well to protect your health. Soil – not just mud! Usually the only magazines I buy are The Big Issue and a TV guide but recently I bought an issue of Country Life because HRH The Prince of Wales was guest editor. He has run Duchy Home Farm organically for 30 years and he understands farming. One topic Prince Charles wrote about was soil. Research by University of Sheffield suggested that the nutrients in the soil will run out in 100 seasons if we carry on as we are. Other researchers think 60 years unless we start to reintroduce more sustainable practices now. Forty percent of the world’s agricultural soil is now classified as either degraded or seriously degraded (meaning that 70% of the topsoil is gone). Our soil is being lost at 10 to 40 times the rate it can be replenished. In some parts of the world over-intensive farming has created desert. Growing plants use 60 minerals and trace minerals which they draw from the soil. Artificial fertilisers do not replace all these trace elements; they focus on three that make plants grow quickly and give high yield: nitrogen, phosphorous and potassium. Sadly this means that the mineral content of our food is reducing. Animals and people need diverse minerals. As the soil becomes depleted, we can suffer from deficiencies that affect our health. 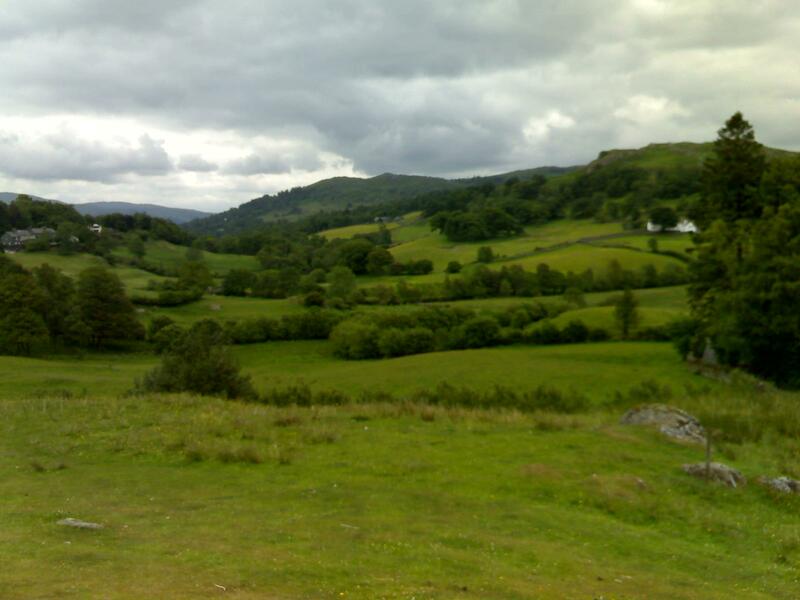 We often see farmers muck-spreading in Cumbria; it gives the land ‘heart’. Don’t moan about the smell, rejoice in the goodness going back into the soil! Top tips – support our good local farmers. As you know by now, I’m keen for people to eat the way nature intended – of which more next month. But this time I’m going against that philosophy to tell you about something we were definitely not designed to eat. Why? The nutrient levels in our food have reduced and with the way that we live nowadays, it can be good to treat our bodies to a bit of a boost. 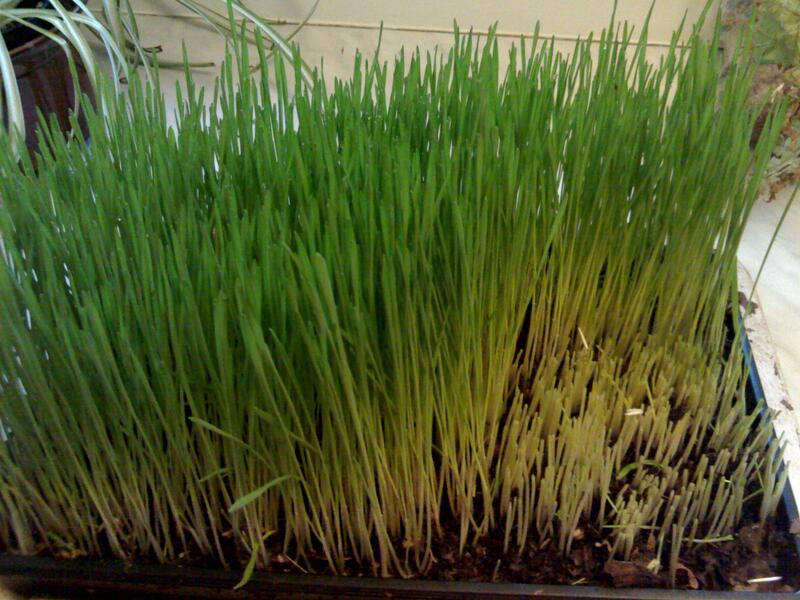 There are several ‘Super-foods’ we can eat to fill the nutritional gap and for me the king of them all is wheatgrass juice. I call it liquid gold (actually it isn’t gold, it’s bright green!) Full of vitamins, minerals, enzymes, amino acids and chlorophyll, each 2oz shot packs a mighty punch. When I drink it regularly, I feel more alive. It’s as if my brightness control has been turned up. I haven’t come across any juice bars where I live, so how do you get some? 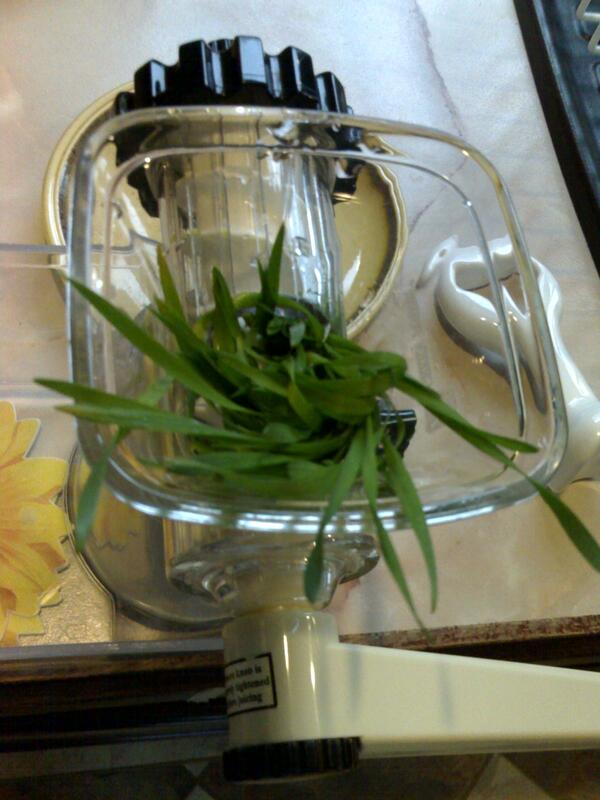 I think it’s best fresh so I prefer to grow my own wheatgrass and juice it myself. If you don’t fancy the faff of the DIY route, there are companies that sell it in different forms. Some supply the juice frozen in little pots, others sell it pressure treated in pouches which don’t need to be kept cold. There are also dried powders and pills but you’re unlikely to get the full enzyme benefit from these. Is there any downside to this wonder drink? Sadly, it tastes awful! We don’t have the digestive machinery to eat grass so we naturally dislike the taste. 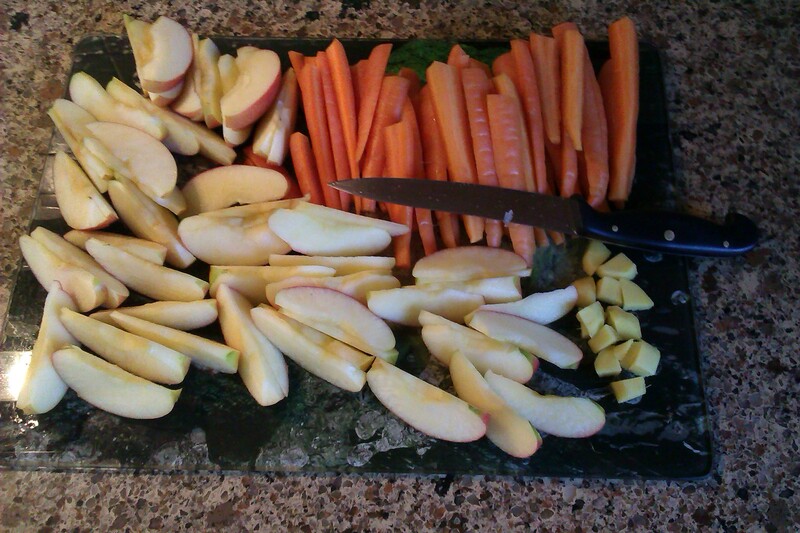 Juicing is a cunning way to squeeze out the goodness and leave the cellulose behind in the pulp. I add other vegetables and fruits to the juice to make it more palatable. 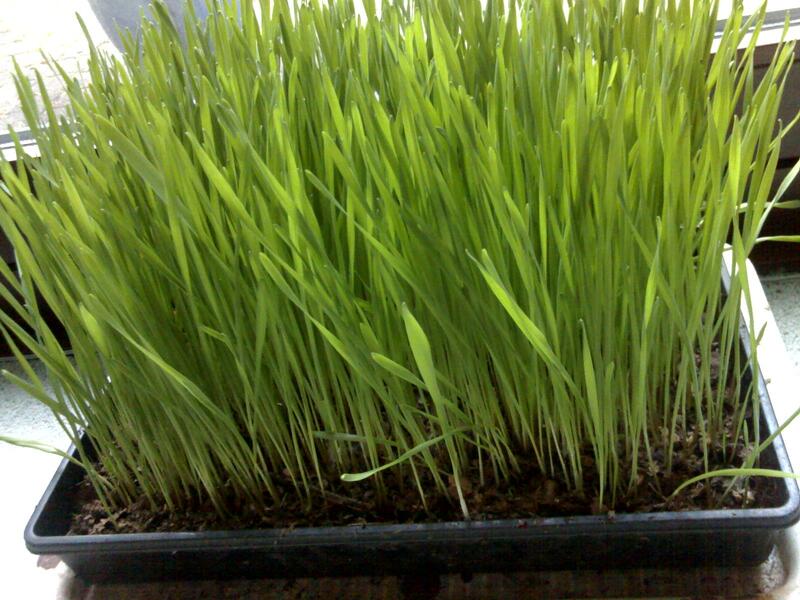 If you want to know more, visit the wheatgrass page on this website and watch the video of Paul creating a delicious ‘salad in a glass’. Top tip: Treat yourself to a super-food boost with wheatgrass juice.